If you are looking for a UEFI / GOP Vbios for your video card here are a few things we need and there are a few things you need to know. 1.) Vbios versions vary with-in models. This is due to different variations and improvements made in time. In order for us to be able to get you the right VBIOS. We need your serial number. 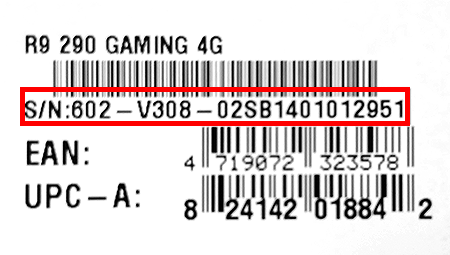 The serial number can be found on a sticker on the bottom of your card or on the box in which it came. 2.) Don't use a vbios provided to another users. Just because you have the same model, doesn't mean you need the same vbios. While flashing the wrong vbios is in most cases (=not all) recoverable, it is still more work. It is fine to post in that thread with your serial number asking if you can use that VBIOS. 3.) We will usually need to check your current vbios. We can check your vbios in one of two ways. A.) Upload a copy of your current vbios somewhere and give us a link. You can save a copy of your vbios using >>GPU-Z<<. This will copy all of the information we need into a txt file you will fine in the folder in which you placed nvflash. 4.) Be aware that gpu-z screenshots or what gpu-z reads out as bios version are NOT of any use for identifying the required vbios version. While it doesn't hurt to add those when S/N and an actual copy of the vbios are also supplied simply just adding screenshots or version readouts will not get you any further and us having to ask for the required informations.